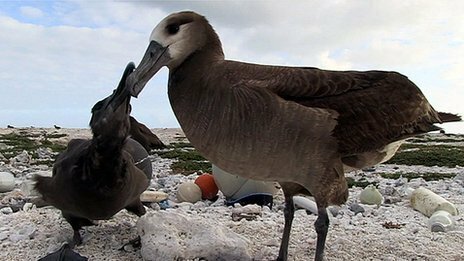 Albatross parents feed their young chicks plastics and unwittingly kill them. Last summer, when filming for a series to be broadcast next year, a team from the BBC’s Natural History Unit saw first-hand how discarded plastic can end up thousands of miles away from where people live when they visited French Frigate Shoals, an island north west of Hawaii. 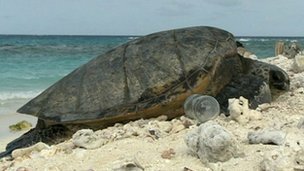 There they found turtles nesting amongst plastic bottles, cigarette lighters and toys. And they discovered dead and dying albatross chicks, unwittingly killed when their parents fed them plastic carried in as they foraged for food in the sea. Some of the chicks die when sharp edges puncture their bodies, others from starvation as their stomachs fill with plastic they cannot digest. We have known for a while that plastic is a threat to the albatross, but how dangerous is discarded plastic for other wildlife and could it affect us? Some of the plastic in our oceans has been illegally tipped at sea, or is litter from fishing, most comes from the land, from poorly run landfill sites and industrial waste. Floating debris is carried to the Hawaiian archipelago by giant rotating ocean systems, or gyres, partly driven by air currents. Hawaii sits in the midst of a gyre known as the North Pacific Sub-tropical High. The North Pacific gyre is one of five gigantic interconnected systems of ocean currents. Each spirals around a central point, drawing material inwards. These spirals can also eject material, out towards the Arctic and Antarctic, spreading plastic across the globe over time.